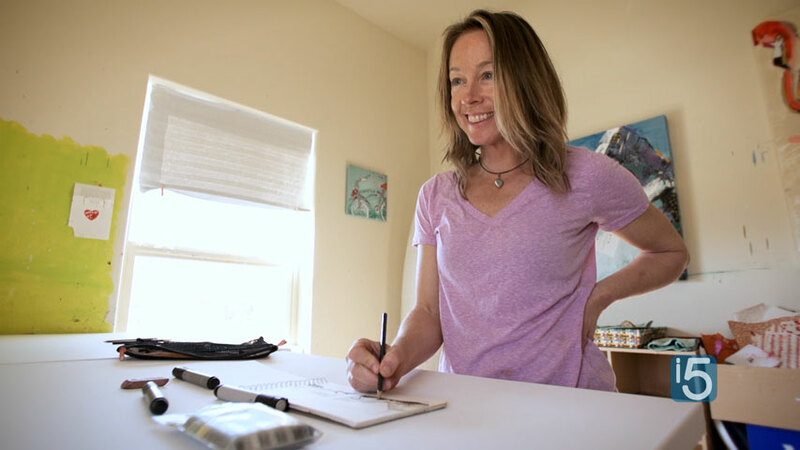 I’m excited to introduce you to Kellie Day, a mixed media artist from Ridgway Creative District, Colorado Certified. In her artwork, Kellie loves to create a sense of feeling alive – she doesn’t want to just feel warm and fuzzy. When a piece is done, she wants to feel a little edge, a bite on her cheek as though she’s been slightly changed by it. Within your work, when do you feel the most alive? Please consider sharing your thoughts in the comments below! Kellie Day grew up in industrial towns in the Midwest. Visions of smoke stacks and college in the armpit of Indiana gave her a hard shove towards seeking beauty out west. A decade and a half of voraciously traveling the globe, climbing, and rangering for the U.S. Forest Service led her to settle in Ridgway, Colorado. Between her graphic design and painting studio, Kellie Day is a creative factory. ‘I would like it if every aspect of my day and life touched beauty.’ Kellie has a seven-year-old son, Chente, and two rescue dogs.